Successfully Added 2 In 1 Bluetooth + Wifi PCI Card to your Shopping Cart. All in one PCI card to bring your computer up to date with the latest in wireless technology. 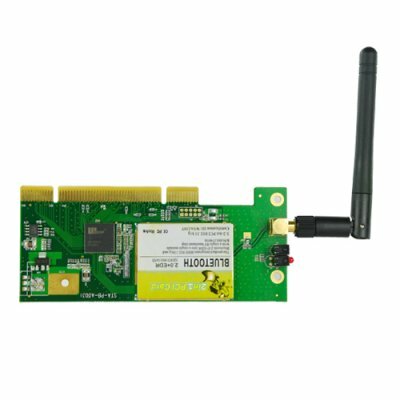 Simple to install, and with easy to use software included, this powerful dual use PCI card features the very best and latest in both Bluetooth and Wifi technology. This is the computer accessory you need to make your computer the best it can be, and at the wholesale discounted price Chinavasion offers this Wifi and Bluetooth device at, it is sure to be a high profit reseller for any one. If you're a windows xp, vista, or 7 user you're sittin pretty when you open the sleek, shiny box containing this powerful wifi/bluetooth combo card. If you're a linux user, happy hunting for drivers. Running linux means good support with the included software if you haven't ran any updates in 2 years. The supported kernel is quite antiquated. However if you hop on over to ubuntuforums' website, you'll see I have posted the latest drivers needed to run in linux (posted both 32 and 64 bit). Software for card in linux however does not seem to support WPA2 with TKIP, so you may want to consider adjusting your router's security settings to straight WPA or WEP encryption. Once you get it up and running, there is no lag whatsoever in transfering files to my phone and downloading system updates at the same time. Terrific value for the price, pity the software for linux out of the box wasn't up to par though.